Spoilers in this post, obviously. Lucifer and the Biscuit Hammer is a cult manga hit. Beneath the ridiculous, overblown plot of a boy and a girl’s quest to save the world (while plotting to destroy it), it’s really a story about growing up and accepting the burdens of adulthood. The old-school Gainax influences are plainly evident in the art style, so you wouldn’t be the first one to think of it as a more coherent FLCL. I freely admit that the ending Got To Me. I was surprised by how much it resonated with me, considering how conventional it was. In fact, the more I think about, the more I’m surprised about this, since one of the main things I totally thought was going to happen didn’t actually happen. I assumed that Samidare would die at the end. For all her upbeat energy, I interpret Samidare as a tragic character. This is a girl who spent most of her early childhood in a hospital. We know that she wants to destroy the world because it’s her way of accepting the knowledge of her own impending mortality. Her logic makes a twisted sort of sense. Her confrontation with Yuuhi is the real final battle of the story. It was foreshadowed since the first chapter. At this point, she and the Beast Knights have already saved the world from the Biscuit Hammer. She is aware that only she will be stuck in time while the others will have the opportunity to move on with their lives. Perhaps this is why she wanted Yuuhi to be her personal knight. By fighting against him, she entrusts her life to him. A part of her wanted him to reach out and stop her, but she didn’t know how to express her inner desperation. At this point, I did not think that Yuuhi would kill her or anything so ridiculous. But I did expect him to defeat her, and that this would prompt her to accept her fate. I fully expected for her to succumb soon afterwards to her illness. After all, death was not unprecedented in the Lucifer and the Biscuit Hammer-verse. That is why this moment hit me so hard. “If Sami were to die of her illness, it would be in the company of those who love her,” I thought. That thought brought me comfort, because in my heart, I had accepted such an outcome. Of course, as it turned out, Sami survived the surgery and ends up living a long and happy life with Yuuhi. But that’s not what mattered about that moment. None of the characters knew that she was going to survive, so their emotions came across as genuine to me. When Sami broke down and apologised to her friends, she was assuming, just like I did, that she would die soon after the battle was won. She loved the world, but she no longer wanted to destroy it because she realised that she loved her friends more. She admitted to herself that she wanted to live. It takes real courage to continue living when the odds are so heavily stacked against you. That is the real battle children and adults fight every day of their lives. The time you have with your loved ones is finite, and that’s what makes it so precious. In that situation, I think Sami’s reaction was one of the bravest I’ve seen. 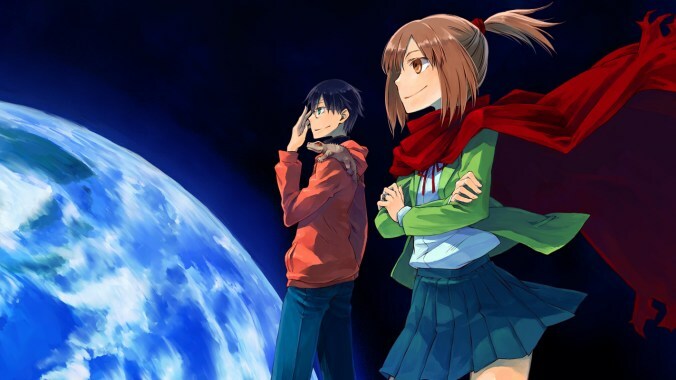 Posted on February 28, 2015, in Reviews and Impressions and tagged flcl, hoshi no samidare. Bookmark the permalink. 16 Comments. What surprises me most looking back is how well the author handled death in this series – such deft touch on the topic is usually found only in far more ostensibly ‘serious’ and grave series. Though, considering one of the author’s current ongoing series deals with reincarnation heavily and he’s great in general, perhaps not so shocking. Yup, his new work, “Spirit Circle”, is really interesting and I have high expectations. Yep, I’m definitely going to read his other works. Despite the idealistic themes of the story, it had such a sombre and nostalgic framing, like it was the story of an adult looking back on his childhood. I think that’s what I liked the most about Lucifer and the Biscuit Hammer. Now you are reminding me of my childhood. :'( I’ve read this years ago. And yea, I agree that the story is really beautiful. The way they make the endings is also…. surprising. In a good way. I thought this will be one where most characters died…. Once upon a time… long ago, I wanted to make a fic of it, a continuation or some sort, but i feel like it would ‘stain’ the story, so I’d rather not…. I think the ending worked precisely because Lucifer and the Biscuit Hammer had never sold out to cheap resolutions before and because, really, Sami’s surgery wasn’t a cheap resolution either, but a kind of beautiful conclusion pulling in everything about her journey to that point. Good people with beautiful souls…those are the hardest kind to watch after they’ve given up. Sure, Sami always had her quest to destroy the world on her own, but that was really an expression of her despair. I think that was what made her such a tragic, compelling character for me. She was clearly a person of the highest caliber, driven to despair by her situation in life. And to have it be something as mundane as terminal illness in a world of fantasy and magic…that just made the poignancy of her situation all the stronger. Yes yes YES! Sami was always morally ambiguous with her actions, but it wasn’t until her mother came home that I fully realised that she was insecure in the most ordinary of ways. Her desire to destroy the world sprung from that insecurity, and she went about it in the most chuuni-est, grandiose way possible. I think that was her way of saying she wanted her life to matter. She wanted the world to mean something and she wanted to mean something to the world. I’m glad that eventually she realised there were more productive ways of applying her enormous talents and energy. I feel like there are so many extraordinary young people out there like Sami. People who struggle to express themselves, but would have so much to contribute to the world if they did. I’m really glad she got to live out her potential. And isn’t that just how we always overcompensate for our insecurity? With our chunni attempts to be the hero (or, in Sami’s case, the villain) who will never be forgotten? When you’re young (and heck, I still grapple with this), it’s really difficult to come to terms with the fact that you, your particular mark on the world might not be as big as smashing the world with your fist. Instead, you might be planting flowers or building a pond out in the forest. And that’s okay! But when you’re young and feeling insignificant, often the easiest thing to do is to imagine yourself making a big ole splash. That’s where dreams come from and it’s certainly not bad to have them! But not everyone is built to be a world-destroying princess. There are other, quieter, beautiful ways of being alive. I’m surprised no one’s made an anime adaptation for this yet. The general setup looks pretty promising. Yeah. 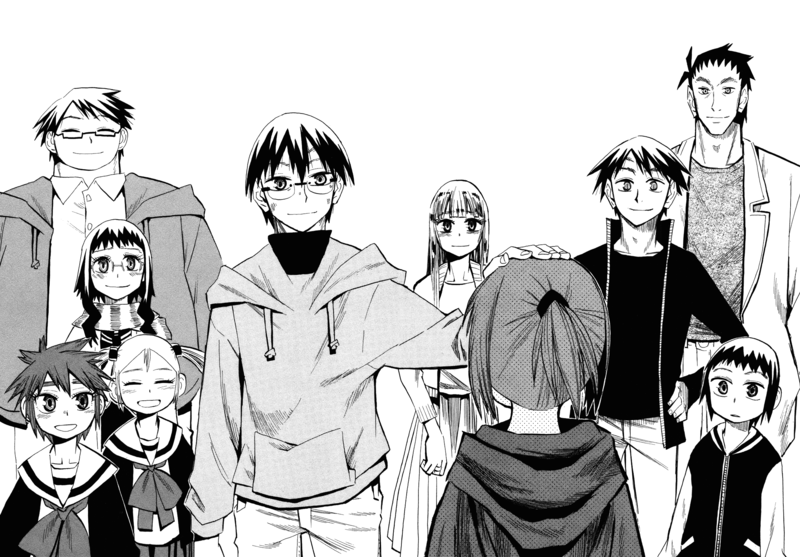 Still, it’s been five years since the manga serialisation ended and no anime, so it’s not looking very likely. Then again, Parasyte got an anime, so who knows? Yeah, it looks extremely anime-able. It’s got some decent action scenes that would also look far better in animated form. Who knows, digging up old mangas for anime seems to be a trend these days (Jojo, HunterXHunter, Parasyte, Ushio and Tora…) so let’s hope. I came to your website to read that information about Kokoro and decided to check this post out as well. I’m glad to people still talking about Biscuit Hammer, as I remember it from way back when I started reading manga really heavily. Back then it almost felt like no one else was reading it, so I’m glad to have randomly come upon someone espousing about it.